It’s every model maker’s fantasy … to build a full size model of their favorite car (and then destroy it). And now that 3D printers have gone mainstream, it’s possible to do so. That’s what the producers of the 25th James Bond adventure, Skyfall, discovered when they needed a “stunt” Astin Martin which would be destroyed by a helicopter gunship. They didn’t want to destroy a classic and iconic automobile synonymous with 007, so they “printed” one instead. A 1965 Astin Martin DB5 isn’t cheap, one of the original Bond picture cars recently sold at auction for $4.1 million. That’s a heck of a dent in your film budget if you’re planning to destroy it, especially when you need three of them. So the producers went to Voxeljet, a company that specializes in rapid prototyping – otherwise known as 3D printing. 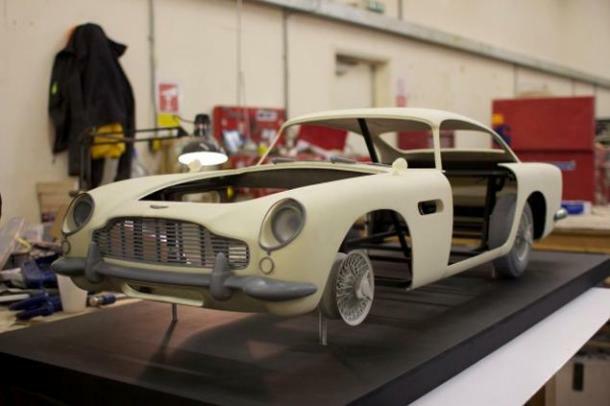 The large format 3D printers could’ve banged out the entire DB5 in one piece, but the script called for doors and windows to open and close, so, Voxeljet printed out 18 plastic components made of 54 total parts and built put them together just like a model made from Revel. And while the mock DB5 is only 1/3 scale, it’s large enough to look quite convincing, after given a chrome paint and bullet holes by technicians from PropShop at Pinewood Studios. Cost? Well, one sold at auction through Christie’s for $100,000. A heck of a lot cheaper than cratering the real McCoy. It’s certainly a ground breaking leap forward in art direction. The ability to go from 3D model to printer and then assemble will dramatically decrease design and development times and make it easier to make last minute changes to models before the final assembly is done. It’s a very exciting tool that gives filmmakers another arrow in their quiver. Now, could producers have destroyed a 3D model instead? I suppose. But at the end of the day, it would probably be cheaper and more realistic the to destroy a 3D printed model than go with additional CGI in the post production pipeline. Although it’s been around for many years, 3D printing has been a revolution of late thanks to the MakerBot, a desktop rapid prototyper invented by Make Magazine’s Bree Petis. There are several ways to 3D print, ranging from lasers solidifying silicon jell with pinpoint accuracy, to an image being made with plastic powder which gets melted and bonded one thin layer at a time until you have the final product. What’s left is usually a matter of sanding and painting until you have the final product. Voxeljet’s 3D process is a bit more refined, and it would have to be since the model is pieced together like a 12 year old working on his favorite model kit. But the results are indistinguishable from the original. So, once again, the computer, along with a 3D printer, changes everything in Hollywood.